Thanks to my friend Todd Caudle, this is too cool not to share. I love studying the land from the air and the flight from Denver to LA is such a rare treat – Front range, Swatch Range, Elk Mountains, Colorado Plateau, Monument Valley, Grand Canyon…all in a couple of hours western tour. So, I sent Todd this photo, converted to black and white because of the overwhelming blue from so high in the sky, and asked if he could help me identify the main peaks. I knew Todd would work his annotated magic, and so this photo is much more meaningful. To see the hallowed ground of the Maroon Bells-Snowmass Wilderness that we’ve trekked a week at a time, the high passes, towering peaks, deep valleys – all condensed into a rectangular frame is pure magic. All witnessed through a tiny window. Posted in Colorado Mountains and tagged aerial, elk mountains, rocky mountains, winter on February 23, 2016 February 23, 2016 by Dave Showalter. Just before dipping behind Gothic Mountain, the setting sun illuminates a stand of red-tipped autumn aspen. 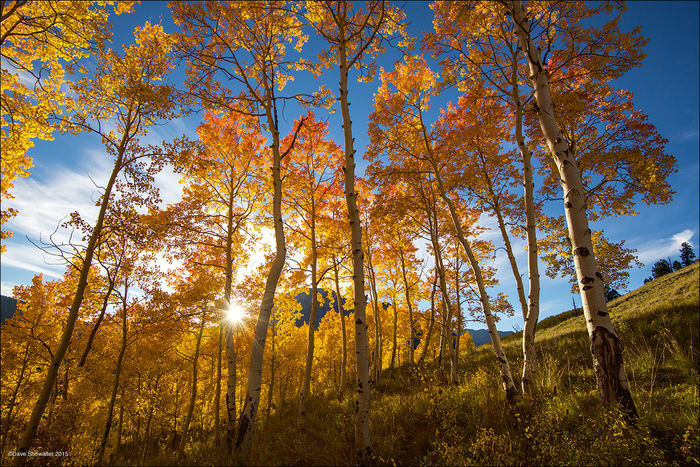 Aspen trees are colonial and colors vary greatly, from typical gold to oranges, reds, even purple. The range of color and contrast is on full display in Colorado’s high country, beginning in mid-September, with the transition moving south into early October. Posted in Colorado Mountains and tagged autumn, colorado, fall color, rocky mountains on September 30, 2015 by Dave Showalter. 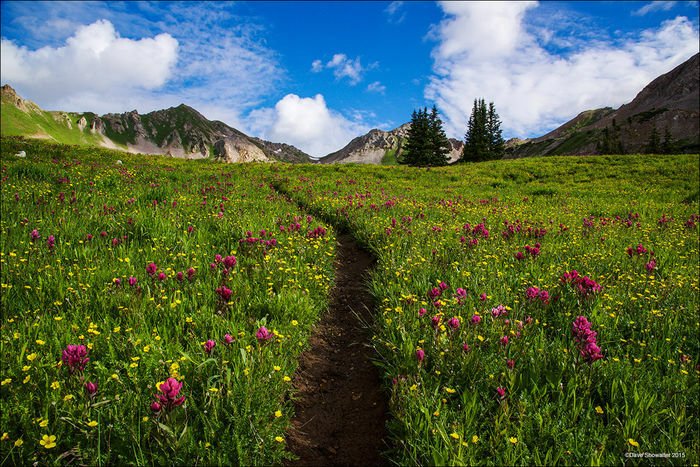 Our path to Silver Creek Pass leads through a verdant green alpine meadow of blooming Indian paintbrush and cinquefoil wildflowers. The pass is the patch of snow in the low point between the mountains (a 1,500′ climb), where a staggering view of (14,130′) Capitol Peak awaits. The pass ahead is a window to a new world, one of the great gifts of exploring on foot. We ascended 1,500′ to a low point on the flank of Meadow Mountain, where Capitol Peak shone in afternoon light while clouds swirled ominously around the basin. Runoff from both sides of the pass feed the Crystal River, a tributary of the mighty Colorado. Snowfall from the spring monsoon is finally melting off, opening the mountains for a few short months of exploration, before the cycle of seasons starts anew. The brilliant green tundra and blooming wildflowers are almost an illusion, a fleeting moment of alpine rhythm. Posted in Colorado Mountains and tagged backpacking, Capitol Peak, hiking, maroon bells, rocky mountains, summer, wildflowers on July 31, 2015 by Dave Showalter. Longs Peak (14,255′) and Mount Meeker (13,911′) catch morning light from Estes Cone, casting a long shadow on Longs’ flank. Rocky Mountain National Park, Colorado. Alarm and coffee pot spring to life at 1:30 a.m., an uncivil time of day by any measure. Grumbling and light-headedness aside, backpacks are tossed in the car for a drive amongst folks just trying to get home. It’s exhilarating to reach the trailhead a few hours before dawn, before birds wake, and set out to follow a cone of light through a black forest. Our destination is Estes Cone, an 11,002′ bump on the Estes Park skyline with a commanding view of Longs and Meeker. A nearly full moon barely penetrated the dense forest as we trekked on good trail that split from Longs’ standard climbing route. The finishing ascent rose 1,000 feet to lichen-covered stone just above the forest canopy, revealing Longs’ eastern face. Rising above a low cloud bank, the sun graced Longs and Meeker in warm light, showing features of the main climbing route, The Trough still clogged with deep snow, guarding the highest peak in Rocky Mountain National Park. First climbed by John Wesley Powell’s group in an 1868 expedition, Longs is a sentinel in stone that can be viewed from many angles and worthy of a photographic study – and an alpine start or two. Posted in Colorado Mountains and tagged alpine, colorado, front range, rocky mountain national park, rocky mountains, summer, sunrise on July 6, 2015 July 7, 2015 by Dave Showalter. As the setting sun dipped below a drifting storm cloud, the high tundra and 13,000 foot giants of the Front Range and Tenmile Range are painted in cinammon light. Lenawee Mountain (13,205′) is on the left top of the frame and distant Quandary Peak (14,265′), in the Tenmile Range, is on the upper right side. This image was made from Point 12,915′ above Loveland Pass and there are two climber’s tents perched on the ridge, just before it falls off. Just a week after the last post, we spent an evening at 13,000 feet on the high ridge that towers over Loveland past on the east side. We trekked to Mount Sniktau (13,234′) for the first time and hoped for golden light to break beneath a thick cloud bank, lingering after a passing storm. With temps hovering in the 50s, the sun dipped and the landscape took on a new glow, with forms and layers of mountains in all directions. A small group of climbers set up tents on the edge of the ridgeline, later telling us of their plan to climb Grizzly Peak and two fourteener’s – Torreys and Grays the next day. Camping close to 13k is often a very bad idea, but not on this evening. I liked this image best for the snowfield clinging to the ridgeline, and together with our trail, leading the eye to an unending vista of the Rocky Mountains at sunset. It seems winter will depart at last. Posted in Colorado Mountains and tagged climbing, front range, hiking, loveland pass, rocky mountains, sunset on June 29, 2015 by Dave Showalter. Patterns of snow fill every couloir while stoney ridges protrude like ribs on (L to R) Torreys Peak (14,267′), Grays Peak (14,270′), and Grizzly Peak (13,428′). Colorado’s wet spring raised the late winter snowpack on the Front Range from around 50% in April to 300% in some areas. We hope it predicts an amazing wildflower season. We have so much snow! The south and east facing slopes are holding deep snowpack that supplies all of thirsty Denver’s water supply for the season. This view is to the northwest across Loveland Pass to Mount of The Holy Cross (14,009′) named for the cross couloir on the rock face. Will Denver residents become complacent and forget the recent decade of drought? My brief prediction is an unfortunate yes. 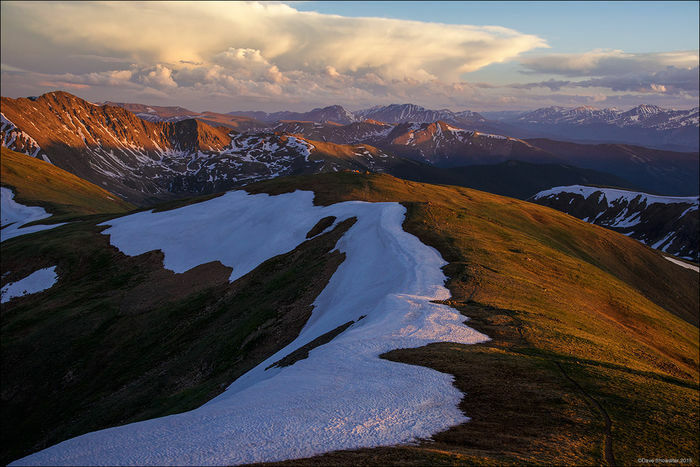 Posted in Colorado Mountains and tagged colorado, front range, rocky mountains, snowpack, summer on June 22, 2015 June 22, 2015 by Dave Showalter. Little Bear – Just Another Peak? Depending on how you count them, Colorado has between 54 and 58 peaks over 14,000 feet and it’s a big thing for adventurers to climb them all. There are main peaks and sub-peaks, and there has to be a 300 foot drop between the main and sub-peak for the smaller mountain to count as a fourteener. Mountain geek stuff. Marla and I have been plugging away on the list for over 20 years and have summitted 45 fourteeners now, some more than once, so we have nine or ten left. Each peak has its own special challenges – distance, remoteness, weather on a given day, route-finding, altitude fickleness, fatigue, etc. It’s inevitable to climb the easiest and close to home peaks first, then gradually spread your wings until you’re left with ten technically challenging peaks, the ante upped, with enough risk to question commitment. That’s where we’re at. On our recent climb of Blanca Peak, Colorado’s 4th highest at 14,345′, and one of the four sacred peaks to the Navajo, we studied Little Bear Peak. Despite it’s gentle name, Little Bear has a bad reputation, randomly taking a life with rockfall or some other twist of fate. The only good route passes through the hourglass, a narrow class 4 bowling alley of loose rock. Guidebooks suggest avoiding weekends and climbing early, so no one is above you in the hourglass. Rockfall is never good, especially when there’s no escape. As we studied Little Bear from Blanca’s glorious summit, we asked ourselves why? Do we need to climb that mountain and take on unnecessary risk? What’s this quest about, destination or the journey? Posted in Colorado Mountains on August 25, 2014 August 25, 2014 by Dave Showalter. From the summit of Humboldt Peak (14,064'), the Sangre De Cristo skyline, a 14er climber's paradise L to R: Crestone Needle (14,191'), Crestone Peak (14,294'), Kit Carson Mountain (14,165'). The bold pyramid shadow is of Humboldt, the peak we're standing on. We made the climb in the dark - me, Marla, Chris, Annie, and Mike were the crew, an ambituous 2:30 a.m. alpine start got us to the summit on time for a spectacular sunrise. Posted in Colorado Mountains, From The Vault on March 27, 2014 March 27, 2014 by Dave Showalter. Curiosity gets the best of this adult yellow-bellied marmot, looking out from talus rocks above timberline. 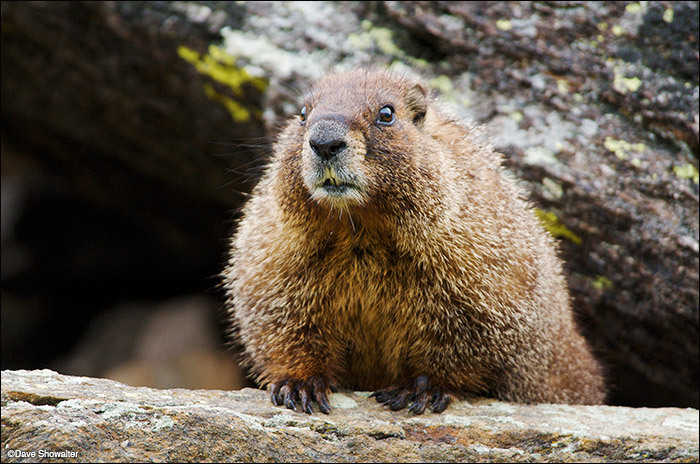 Sometimes called 'whistle pig' for their high-pitched warning call, marmots are common in high mountain rocky slopes. They eat green vegetation and hibernate through the winter months. This image shows the long digging claws that enable marmots to tunnel under rock piles. Posted in Colorado Mountains, From The Vault on September 10, 2013 by Dave Showalter. With a backdrop of Snowmass Mountain (14,092') and Capitol Peak (14,130'), Marla digs for the top of Buckskin Pass. Buckskin is one of the four passes over 12,000 feet that circumnavigate the Maroon Bells Massif. 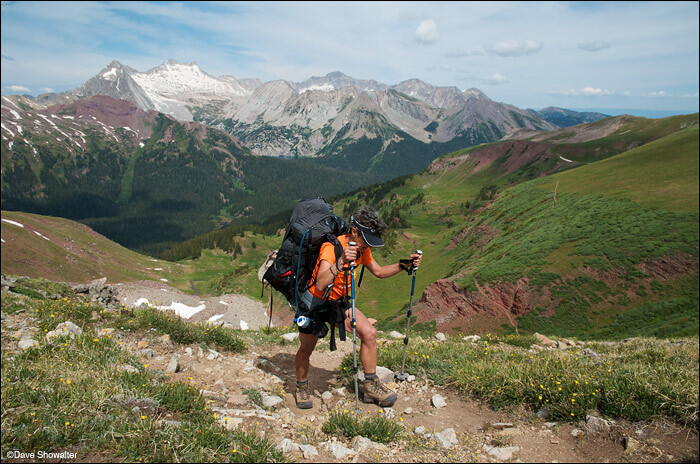 The Four-Pass Loop is widely considered one of the top backpacking trips in North America. Posted in Colorado Mountains on July 29, 2013 July 29, 2013 by Dave Showalter.